cherish | What's new with ELP? Our next Core Course is Ministry Development and our text: From Dream to Reality by Dr. Jerry Nance . 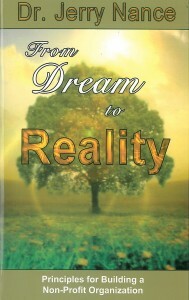 Dr. J outlines 21 principles for us to move our dreams from just a dream – to reality. The leader must hear from God, Pray hard, work hard and then pray God blesses your work, cherish and celebrate victories along the way, learning to laugh and much more. Some of you should have a copy of this book but if you don’t email me at andree.aiken@teenchallenge.cc and I’ll mail one to you. Your first post for this course will be up on the forum Monday, July 20th. You’ll make an initial post and then respond to someone’s post. This month we welcome Todd Adams (Pensacola Men’s) and Glenn Yost (Genesis Men’s Home) to the Level II. Welcome Todd & Glenn! We look forward to a rich learning experience. You can see your dream become a reality as you apply these principles and as you stay faithful to the dream in your heart. Don’t quit short of what God has put in your heart to accomplish! Your first post will be up on the forum on Monday, October 20th.